When I was a kid in the rural south, churning was done in a heavy duty ceramic pot. Butter was made by moving the stick (which had a sort of paddle attached) up and down. 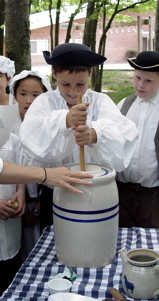 I did not live in Colonial times, but the churn we used looked very much like the one shown in the picture to the left. Ours was a bit taller, I think. The practice of churning to make butter has been around for thousands of years. It is mentioned in the Wisdom Literature of the Bible. The ESV consistently uses the word pressing, from the Hebrew mits, three times in that verse. The NET Bible probably best conveys the meaning of the text by the use of churning, punching, and stirring up. The churn, used for making butter from milk, first appeared in the Chalcolithic Period [6,500–5,500 years ago] and became an important symbol of the time. To speed up the churning process, a rope was tied to the handles, and the churn was rocked back and forth. 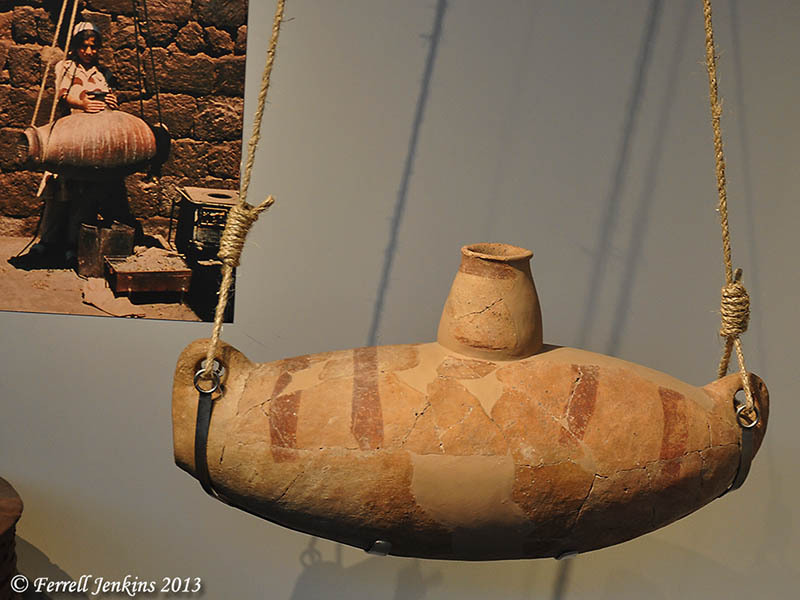 Chalcolithic pottery churn from Beersheba. Israel Museum. Photo by Ferrell Jenkins. During a visit to Petra, Jordan, in 2008, a group of people were portraying the costumes and activity of earlier Bedouin. Many of the customs portrayed are the same as those we read about in the Bible. In the photo below the man is rocking a churn made from an animal skin. 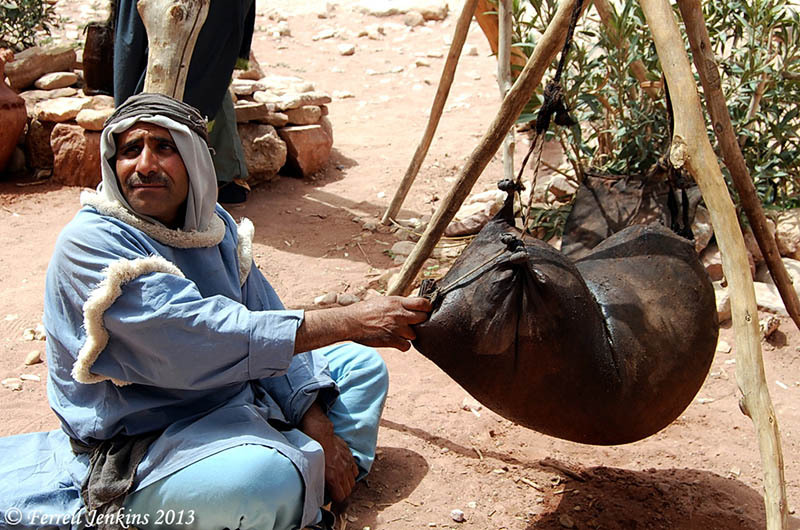 Bedouin churning butter in an animal skin at Petra. Photo by Ferrell Jenkins. 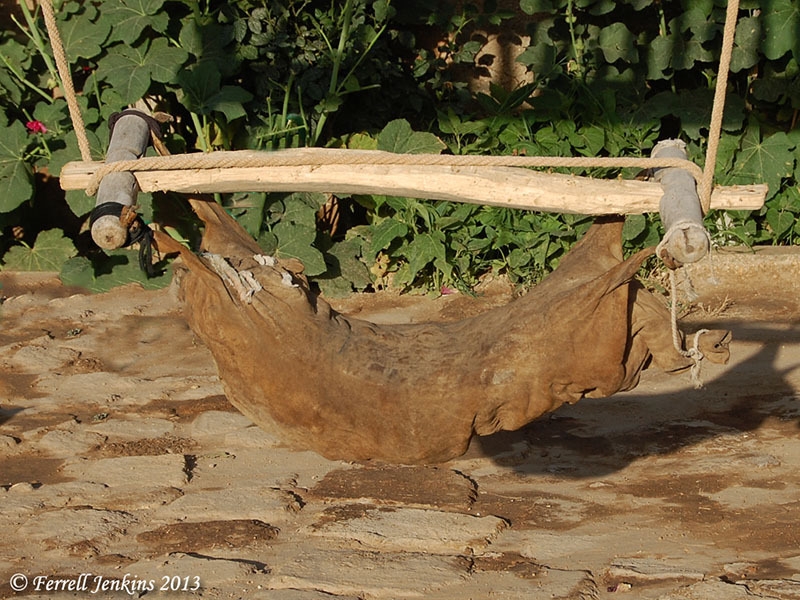 Finally, here is a photo that I made at Haran in southeastern Turkey, once the home of Abraham (Genesis 11:31 – 12:4), showing a churn made from an animal skin. Churn made from animal skin at Haran. Photo by Ferrell Jenkins. This entry was posted in Archaeology, Bible Lands, Bible Places, Bible Study, Culture, Israel, Jordan, Old Testament, Photography, Travel. Bookmark the permalink. I really enjoyed seeing the churns at the Israel Museum. They brought back many memories of churning butter with a hand churn. I wish that I had one on the rocker back then :-).